The Type RPD-2 Radio Frequency (RF) Proximity Detector is designed to detect and locate devices that radiate radio waves in the high frequency to low microwave frequency range. Such devices often include surveillance and “spy” equipment. The Type RPD-2, when used with the different sensors, will detect the emanation of the radio wave within a confined area, and then isolate its location to within approximately a square foot. The type RPD-2A may be used as an RF field strength indicator for antenna field strength measurements. The RPD-2A is identical in function except that the meter scale is calibrated in relative dB units. Both models incorporate a broadband RF sensing circuit followed by a high gain amplifier and meter driver circuit. Power is provided by a single 9-volt battery. Three different sensors are available for the unit. The Type RFR sense antenna is a helically wound, rubber duck type antenna which is used to sense RF in the 90 MHz to 1 GHz range, and would be used in a typical area “de-lousing” operation. The Type RFL broadband electro-static loop sensor used to localize the RF radiation to an exact location. 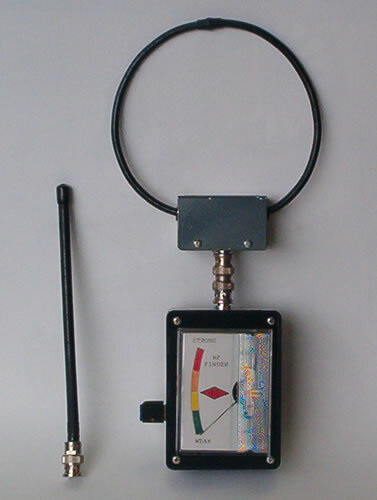 The Type RFH sense antenna is a collapsible whip that may be used for sensing RF in the high frequency radio spectrum and antenna testing measurements. Contact National RF Inc., for availability and delivery.